Navigation: Home » Investing » Divining Future S&P 500 Closing Prices! Direction – Will a security trade up or down? Magnitude – How large a move will a security make? Timeframe – How quickly will the security move? Compare that to stocks – if someone is buying, that means that they are betraying the direction they think the stock will go (up). We don’t have a clue about the other two. In essense, the information given to us by options is three times more valuable than that of stocks. Yes, you’re right, Don’t Quit Your Day Job wasn’t the first to use this metadata to build indicators. People have been watching options price movements for years, and concepts like Options Pain were well known before our site even started. However, we take it a bit further. 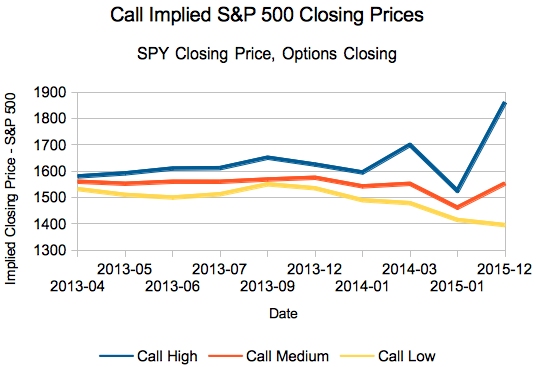 We built an options ‘implied closing price’ calculator way back in December of 2011. You can see the initial results of that effort here, and our thoughts on the quality of the signals (not so amazing). 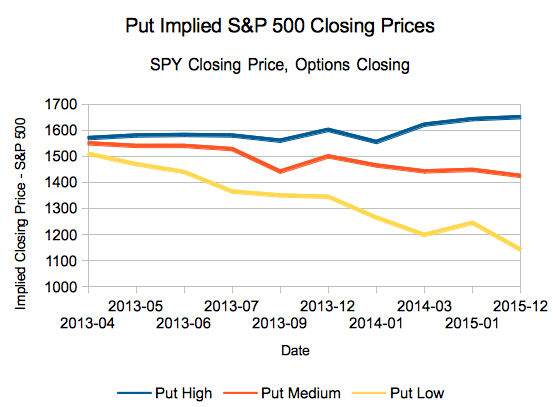 How Do You Predict the S&P 500 Closing Price? As you would expect, uncertainty increases as you move further out in time. These results were retrieved after the market closed on March 28th, so try to figure out where the mispricings lie before the market reopens. How to Use These S&P 500 Predicted Closing Prices? Well, we haven’t yet gotten around to trying to tease out some correlations and actionable trades on this – but if you read our warning article above, you’ll note that the predictions implied by options were only correct 44.3% of the time… even though 75% was implied by pricing. That means that over the universe of the predictions we pulled, over 50% of closing prices were in the implied 25% area – and usually higher. An amazing year? A coincidence? Well, we won’t know for a while – but I present these numbers as is. Hopefully one of you makes a ton of money off of this information! Don’t get me wrong: I LOVE predictive markets. They’re brilliant and we should be relying on such markets as replacements for a lot of unreliable BS, e.g. political polls. HOWEVER, the stock market itself is a predictive market based on people putting their “money where their mouth is” to predict the future performance of stocks while incorporating all publicly available current information. I understand options are interesting because they allow the assessment of risks of that number going up and down but they’re really just guesses; people are buying them because to limit their risks, not to predict outcomes. And they’re often doing it to limit the most extreme risks either way for their portfolio. Too often it isn’t a real bet on actual performance, unlike betting on a sports event or election. I am more optimistic about finding some signals in options than you (perhaps with adjustments for ‘insurance’ type purchases) – just like with stocks, no one is buying options to lose money, even if some of the buying is out of the money to prevent huge drops on held shares. Consider covered calls, a strategy which a number of people specifically use to generate income from a sideways market – and someone has to buy those options expecting the security to appreciate. Also, I know it’s not proof, but since this is really just a play on implied volatility, we’d have to toss out a bunch of other calculations and calculators as well. Two other options: this information is only valuable relative to the predictions on other stocks/securities, or, perhaps, figuring out magnitude is more useful. A left-field option: maybe the information is more useful in terms of risk tolerance? Still, there is probably something exploitable about this information – since the estimates have been low and only correct ~44% of the time, someone should be able to make money off it, haha. Interesting concept, thanks for sharing. Great presentation about S&P 500 Closing Prices! Good prediction, hope futures prices go with graph that’s good for everyone. Thank you sir – but I’m rooting for a more bullish outcome!